Author: Zebrowski, George Set In . . . 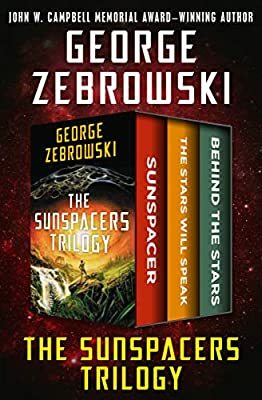 The Sunspacers Trilogy is a trio of novels of an alternate, earth-based civilization. In Sunspacer, young and idealistic philosophy student Joe Sorby must come to terms with adulthood while negotiating the gross injustices of interplanetary commerce. In Stars Will Speak, an alien signal is broadcast from the farthest reaches of the known galaxy . . . but will the scientists of earth decipher its warning in time? In Behind the Stars, young Max Sorby returns to Earth after spending all of his life on a mobile space habitat, fearing that the only home he has ever known will be lost to him forever.